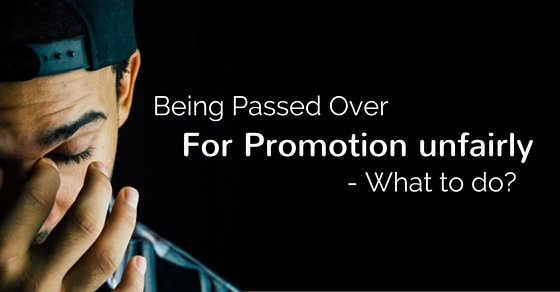 Being Passed Over for Promotion Unfairly – What to do? Anyone who is career oriented will tell you that the main reason why he puts a lot of effort into his works is primarily so as to get promotions and achieve success. It is often said that success comes to those who wait, yet things do get a little frustrated when you are continuously passed over for promotions unfairly. So, to guide you along the way here is a list of things which you can do so as to help you move past this problem and continue to remain positive. Here in this article, we have discussed few tips on how to manage things when overlooked for promotion at work. The following mentioned are few tips on asking for a promotion and also ways to handle yourself when not getting promoted. In the event of being passed over, unfairly chances are that you might be experiencing a number of different emotions at the same time. What you must do is take this in a professional manner and try your best to move on. So as the promotion is being granted to someone else, do not take it as a cue to stand up in rebellion against it, rather you should keep your emotions in check so that you do not end up looking silly as well as unprofessional. In your emotional state , your mind may say things which you most certainly will end up regretting at a later point in time. At a time like this, some kind of soul searching is in order. It is of paramount importance that you spend some time in quiet contemplation with yourself thinking about the reasons why you might not have been able to bag the promotion. Sometimes it might just so happen that your work may be top notch, yet you might be lacking on some other fronts which is preventing you from being able to move ahead in your work place. But if you know that you have not been able to bag the promotion for reasons beyond your control, like favoritism, then you know that it isn’t your fault. It often happens that the way in which we happen to perceive ourselves as well as our ability differs greatly from the manner in which the world sees us. You have to ensure that you are someone who is very self aware and are not blind to your faults as well as failings as an individual. So do spend some time thinking about whether you are actually as good as you think yourself to be or have you just been fooling yourself into looking at a false representation as yourself. You might be willing to kid yourself, but in the business world, no one has time to sugar coat things. In order to remain a relevant part of today’s 21st century business world, it is of paramount importance that you deliver top quality work at all time as well as under all circumstances, otherwise, you are sure to be left behind in the race called life. As mentioned above it is important to have self knowledge , yet at the same time it is equally important for you to be well aware of what others at your work place are doing, this does not mean you spy on them, it merely implies that you know that you have to always be on your toes. In the event of you wanting to stand up for your rights and speak to your boss or senior, then you should make it a point, to plan out beforehand exactly what you are going to say and which points you are likely to touch upon. You should not assume that just because you are a good speaker you need not plan ahead of time about what you are going to say, rather you should none the less have what you are going to say right at your finger tips, so that you do not end up looking silly, needy or desperate. If you do not conduct yourself properly, no one will take you seriously. Rather than bad mouthing the company or constantly grumbling to your co-workers, it is advisable for you to speak up and convince your boss for a promotion. Once you have made your case and said exactly what has been on your mind, then you will naturally feel much lighter, yet that is not the end you have to carefully listen to what is being said to you. If possible you should also inquire with your senior about ways in which you can improve as a worker. There is some truth in the common saying that hard work pays off, so you should always try your best to improve on your abilities so that next time when there is a promotion being granted they will not even be able to look beyond you. In the business world the company seniors always have the interest of the company at heart and no matter what, they try to choose someone who is level headed, skilled as well as has leadership qualities, so if you are lacking on any of these fronts, you should work on them so that you can get ahead in your career. The first time you are passed over for a promotion seemingly unfairly you will naturally feel terrible and the second time you will feel even worse, yet you should understand that things like this do happen in companies very often, so you need not feel so bad about it. As long as you keep putting your best foot forward sooner or later you will be able to get ahead. You should never consider accepting defeat merely because once or twice things have not gone in your way. After all we are all well aware of the fact that failure is the stepping stone towards success. In the event of being unfairly passed over for a promotion one of the worst things which you can do, is feel slighted and start letting your quality of work go down. Instead when being passed, you should accept this as a challenge and start putting even more effort into what you are doing. Maybe this is the company’s way of testing you to see if you are someone who accepts defeat very easily or not. When you are willing to accept any negativity and defeat that comes your way, then you show that you are an individual with true character and that you also the rare quality of perseverance. When you are in doubt or facing some problems at work, rather than sharing your problems with any and everyone what you should do is talk to your family members as well as friends as these are the individuals that know you the best and they are the ones who will always be by your side, guiding as well as supporting you no matter what. However at the same time, it does not mean that you blindly follow whatever they are telling you to do, rather you should take into consideration all the advice which is given to you, but do only whatever you think is correct. If being unfairly passed over for promotion has really affected you adversely, then you should take a call as whether you will be able to continue working in this company as well as whether or not this is the kind of company which you would like to work at. Happiness and job satisfaction are two things which do matter a lot and if you feel like you are too upset to continue then maybe you shouldn’t. At the end of the day, employee promotions do not only mean a name as well as a salary hike, it is more importantly an important validation of your work which helps you become stronger as a person. Above all other qualities, it is of paramount importance that you as an individual have the qualities of integrity and pride. If you believe that being slighted has been a severe blow to your pride then maybe you should not stand for it and start applying to other companies as soon as possible. If you as an employee as well as worker were not given your dues in this company, then there are plenty of other companies that will be waiting with arms wide open to welcome someone who is able to work well and focus on tasks at hand. If you have been slighted when it has come to get promoted then it is rather obvious that you are not valued as a worker at the organization, so this having been said you need not think twice before handing in your resignation to the company in the event of being able to bag another job. When you hand in your resignation you will silently get the point across that there are plenty of other top companies that are willing to hire a talented and skilled individual like you. One of the worst things which you can do is take this defeat personally and start second guessing yourself as well as your abilities as a professional. If you show that you are someone who is weak then in the business world there will be plenty who will steam roll over you. So ensure that you always have your head held high. If you have been passed over for a promotion then maybe now the time has come for you to rise to the occasion and pass up your game, so ensure that you accept this as a challenge and start outdoing yourself with the future projects entrusted to you. Delivering top quality work is merely half the battle won, it is equally important for you to ensure that your contributions are also being noticed. Working in an unassuming way is good, but sometimes it leads to you missing out on good opportunities. Finally, being unfairly passed for promotions is something everyone experiences in the course of their career so you need not take it personally at any point in time rather just accept this as a part of life, believing that yes sometimes things do not go as planned. You should make your motto in life- ‘to strive to seek to find and never to yield’ no matter what. So these are some of the ways in which you can deal with this problem of being unfairly passed over when the time comes for being granted a promotion. The business world is a very cut throat one indeed so at no point in time should you just sit back and blindly accept the injustice that is being done to you over and over again. It is alright to let it slide once or even twice but beyond that, you should stand up and raise your voice. If what you are saying is taken into consideration, then that is good for you, however, if not, then maybe the only option left before you is to hand in your resignation. Next articleSalary Transparency in the Workplace – Is It Good?